We didn't do much for my birthday this year but we did make it down to the redneck Riviera. Now for those of you who don't know what the Redneck Riviera is, it's one of our better beaches here in Texas on the third Coast. We like Mustang Island where Port Aransas is. It is an old fishing town where President Roosevelt used to come fish for Tarpon. In fact, we stay in the Roosevelt Suite in the Tarpon Inn when we can. But this year it was particularly red because of a bloom of red algae called the Red Tide. 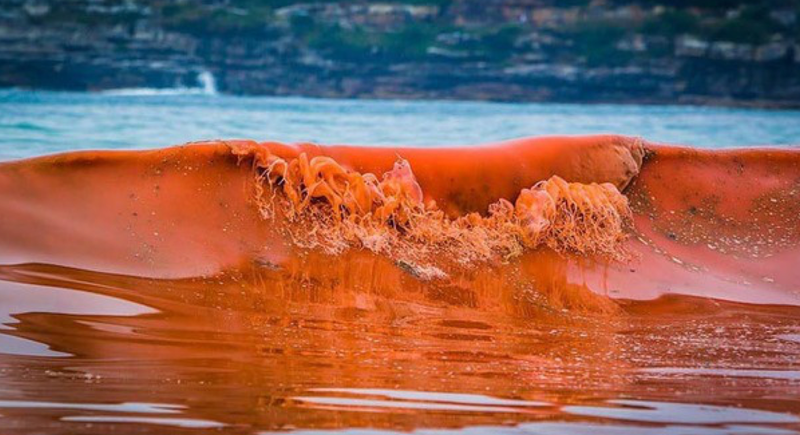 Red tides in the Gulf of Mexico are a result of high concentrations of Karenia brevis, a microscopic marine algae that occurs naturally but normally in lower concentrations. In high concentrations, its toxin paralyzes the central nervous system of fish so they cannot breathe. Dead fish have been observed to wash up on gulf beaches of Mexico and Texas. Dense concentrations appear as discolored water, often reddish in color. It is a natural phenomenon, but the exact cause or combination of factors that result in a red tide outbreak are unknown. 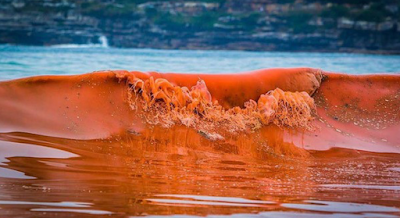 Red tide causes economic harm and for this reason red tide outbreaks are carefully monitored. For example, the Florida Fish and Wildlife Conservation Commission provides an up-to-date status report on the red tide in Florida. Texas also provides a current status report. Red tide is also potentially harmful to human health. Humans can become seriously ill from eating oysters and other shellfish contaminated with red tide toxin. Karenia brevis blooms can potentially cause eye and respiratory irritation (coughing, sneezing, tear production, and itching) to beachgoers, boaters and coastal residents. People with severe or persistent respiratory conditions (such as chronic lung disease or asthma) may experience stronger adverse reactions. The National Oceanic and Atmospheric Administration's National Ocean Service provides a public conditions report identifying possible respiratory irritation impacts in areas affected by red tides. We thought about not going, but what the heck, we gave it a try. There were warnings from the Texas authorities about fish kills only a few miles from the stretch of beach we like to go to and we imagined that the air would be full of fish death and that the beaches would be less than desirable. But, as we got to the Ferry landing at Aransas Pass, we had the longest wait we've had in years. When we got to Port Aransas, we were pleased to see that this off season weekend was actually pretty busy. And even though we were reading about the health dangers of the Red Tide, no one else seemed to be. I asked the ferry loader and he told me that he was fine. The eye and throat irritation caused by red tide results from high concentrations of the algae and rough surf. These conditions cause the red tide's irritant to become suspended in the air in the salt spray. There is typically little or no irritation when surf conditions are relatively calm. In most red tides in Texas, these conditions vary a lot within the space of days or even hours. As a result, the same part of the beach may have irritating conditions in the morning and those conditions may be gone by afternoon. On a calm day, even with red tide in the surf zone, many people can enjoy the beach because there is not a lot of salt spray from the surf carrying irritant to the beach. The best advice for beach visitors is if they feel effects in an area, leave that area and try another one. Some local authorities will post signs on beaches that they manage. Human inhalation of brevetoxins produced by the red tide organism, Karenia brevis, is an increasing public health concern. The scientists, led by John Ramsdell of NOAA's Center for Environmental Health and Biomolecular Research in Charleston, S.C., determined that brevetoxins react with DNA of lung tissue and attach to the DNA-bases that code genetic information. The linkage of chemicals in the environment to DNA is a first step for many cancer causing agents and can lead to mutations in genes that normally prevent the formation of cancers. I'm about as allergy prone as anyone I know. I can sneeze 50 times in a row on a bad day, so we were particularly careful, but no one else seemed to care or notice. I love our Texas beaches. The sand is perfect for carving sand castles and all kinds of beautiful things. You can see mermaids and a dizzying array of sculptures on the right weekend, existing in the blustery wind and waves for just a blink in time. I might have felt a little tickle in my throat, but I figured it was more my imagination. The weather, the water, and the whole experience was as good as it gets. Red Tide is just going to get worse as climate change makes our seas warmer. Meanwhile, the red neck red tide rolls on.